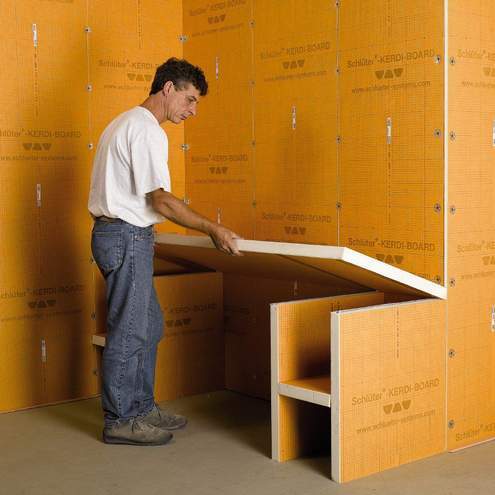 Schlüter-KERDI-BOARD is the ideal substrate for constructing vanities and shelving with ceramic tile or natural stone coverings. 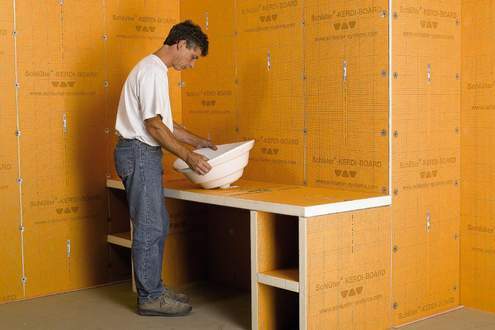 Thanks to the easy cutting properties of Schlüter-KERDI-BOARD (may be cut with a utility knife), the material and the required openings are easy to cut to size. The waterproof material allows for individual and creative surface design. Matching U shaped system profile of brushed stainless steel in combination with a corresponding finishing profile such as Schlüter-RONDEC or Schlüter-QUADEC. Tile strips and two finishing profiles such as Schlüter-RONDEC or Schlüter-QUADEC.